Systemic Oral Enzymes for Tinnitus: A New Therapy for an Ancient Disease by Michael Schedler, M.D. from The Doctor's Oral Enzyme Health Letter - Volume 1, Number 4 As an ear, nose and throat specialist, I have treated more than 5,000 tinnitus sufferers using nutritional strategies including dietary supplements - even though in the beginning my attitude was that you cannot do very much about the condition. I suffered my own bout with tinnitus starting in 1983. It lasted for several years. I attribute its onset to poor diet and lifestyle habits, as well as a long-standing inflammatory condition. Tinnitus is derived from the Latin word, tinnera, for ringing. It's an ancient condition, once ignorantly linked to witchcraft. Today, tinnitus affects 40 to 50 million in the United Sates population, roughly 15 percent. Some six million Americans have tinnitus to the extent that it significantly impacts their life. Fully two million Americans have tinnitus to the extent that it is disabling. Most people live their lives reasonably satisfactorily in spite of their tinnitus, but for others tinnitus can be maddening. Imagine living with an enemy 24 hours a day that no one else hears and that the medical community in general agrees is incurable and difficult to control. Don't feel alone if you're suffering tinnitus. William Shatner, Leonard Nimoy, Tony Randall, Barbara Streisand, Rosalynn Carter, David Letterman, Ronald Reagan, and Steve Martin have all suffered bouts with tinnitus at one time or another, according to the American Tinnitus Association. For some, limbic system reconditioning ("auditory habituation"), enhanced by self-hypnosis, can help to make tinnitus largely inconsequential in their own life. Personally, I changed my diet and lifestyle. 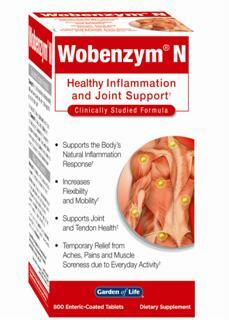 I also used a German over-the-counter enzyme preparation, Wobenzym N, which provided complete relief. I have since confirmed its effectiveness anecdotally with thousands of my patients. Our noisy, polluted urban environment is a prime cause of hearing loss, and, unfortunately, hearing loss, whether it happens quickly or slowly, is closely linked to tinnitus. It is important, however, to understand that hearing loss doesn't cause tinitus and tinnitus doesn't cause hearing loss. It is simply that poor hearing health and tinnitus often go hand in hand. Many experts attribute the problem particularly to occupational and environmental noises, especially sharp explosions. In about two percent of cases the cause may be a vascular lesion, carotid artery narrowing and other circulatory problems in the person's head. A significant percentage of cases, however, have no known cause. The most commonly used strategy in the past 25 years has been "masking." This means covering over the tinnitus noise. Piomeered by Dr. Jack Vernon of the Oregon Hearing Research Center, masking involves substituting a less noxious stimulus, usually in teh same tonal range that is externally produced, to cover the internally produced noise. This is much like the strategy employed by urban residents when thay turn on a fan or music for its white noise effect to mask the traffic or other sources of noise. The masking sound is typically produced from a bedside unit or in a unit worn on or beside the ear. More recently, within the last seven to eight years, a different management strategy has been promoted by Dr. Pawel Jastreboff of the University of Maryland School of Medicine Tinnitus and Hyperacusis Center, Baltimore. The Jastreboff approach to tinnitus is to institute retraining therapy or auditory habituation. Directive counseling explains the anatomy and physiology of the auditory system as it relates to tinnitus. The goal is to recondition the limbic system to let go so the internal noise can cease to be an issue in the life of tinnitus sufferers. In my own case, I changed my lifestyle, quit smoking, began exercising, and eating more consciously, cutting down on saturated fats from beef and dairy. I also was suffering inflammation in my ears and took Wobenzym N as a self-experiment to see how my body responded. My hearing in the higher ranges was significantly improved. I was noise-free within three months. Next, I started treating other patients' hearing disorders with this enzyme formula. I found a strong link between chronic ear infections (chronic running ear), leaking fusions such as puss or clear secretions and proteins, and cases of tinnitus. I have since treated thousands of patients with enzymes with generally good results. That is because out-of-control inflammatory processes are very much to blame for a significant percentage of tinnitus cases among my patients. The patented Wobenzym N formula consists of trypsin, chymotrypsin, bromelain, papain, and pancreatin with a small amount of the bioflavanoid rutin. Volumes have been published about this formula but, oddly, I am probably the world's leading expert on the use of enzymes in the treatment of tinnitus. In fact, I recently published an extensive paper in the German medical literature on Wobenzym N and tinnitus which will soon be translated and made available here in the United States. Because this formula attacks inflammation safely and effectively, I believe that enzymes have a sound basis for use in supporting the body's normal inflammatory processes, and for helping to relieve tinnitus in those patients where inflammation is a factor. I started out using the formula with the worst cases and found out the effects were amazing. Patients were getting better who had suffered for years. In one case, I was working with a very sceptical fellow who had suffered tinnitus in his right ear for 17 years. He started taking the enzymes but came back complaining the noise was worse. I have since found that an intial worsening is not only normal but also a very promising reaction. Indeed, in my experience, this is the best reaction we could possibly desire. I have seen such reactions in many cases and these were truly the ones with the best resolution. An increase in tinnitus levels shows that the remedy is having an impact upon the underlying pathogenic structure. Very often this indicates, that the tinnitus may have an immunologic aspect. I have encountered this often in cases of so called "autoimmune inner ear disease." For this type of treatment, I recommend 10 Wobenzym N tablets three times daily. Once I got my patient on the full program for a few weeks, he was feeling much better and the intensity of the tinnitus decreased significantly. When he got down to a very low decibel reading, he declared, "This is an incredible breakthrough. After 17 years, I have been liberated!" Almost all experts agree that dietary and nutritional strategies that address auditory health in all its facets are critical to providing support to tinnitus suffereres. Reducing fat and cholesterol is extremely important. A high fat and cholesterol diet may end up reducing the flow of oxygen and nutrients to the inner ear due to blood cell clumping. Too much saturated fat and cholesterol contribute to arterial damage in the carotid arteries in the neck that go to the brain as well as other vessels in the head. Medical case reports and studies mention cholesterol "clumps" and overall high cholesterol levels as causes or partial contributers to tinnitus. Studies throughout the 1980s confirm that high fat diets contribute to hearing loss and possibly to tinnitus. Reducing sugar intake is important. Increased sugar intake can cause hypoglycemia. During a hypoglycemic episode, adrenaline is released by the adrenal gland. This causes vasoconstriction of the inner ear and can precipitate a tinnitus crisis. by Michael Loes, M.D., M.D.(H.) from The Doctor's Prescription for Healthy Living - Volume 2, Number 5 Both rheumatoid arthritis (RA) and systemic lupus erythematosus (SLE) often present as progressive disabling diseases. RA and SLE frequently cause internal organ damage secondary to chronic inflammatory responses. These inflammatory responses can be modulated, and arrested before irreversible damage ravages and individual. These types of patients are some of the most difficult patients a pain specialist sees. A balanced approach must be considered - one that uses the best conventional medicine, as well as nutritional, and alternative strategies available to preserve life and function. The drugs that we use such as nonsteroidal anti-inflammatory drugs (NSAIDs), corticosteroids, gold salts and methotrexate are of some benefit but are extremely toxic and can result in damage to the bones and joint matrix. And when it comes to young children and inflammatory diseases, we still have only these extremely toxic drugs. It is tough to see young children on corticosteroids, but doctors try to control the complications the best that we can. Now, thanks to a mountain of evidence, we know that a specific combination of systemic oral enzymes called Wobenzym N, available at health food stores, may be one of the best medicnes for both adults and children with difficult-to-treat inflammatory / joint conditions. In both rheumatoid arthritis and SLE, the immune system is out of control and turns on the body. Although medical science is unsure of the exact cause of either rheumatoid arthritis or SLE, we do know that for some reason the body's immune system begins to form antibodies that cause a chronic inflammation of the joints. Both rheumatoid arthritis and SLE are immune and inflammatory diseases, but few conventional treatments address their underlying systemic condition. Most treatments reduce the inflammation and pain but do nothing to start the healing process. In this sense, enzymes may be superior. Their influence on the immune system is profound and they stimulate healthy production of cytokines that quench inflammation and rev up immunity to produce a cleansing effect, helping to cleave or break up circulating immune complexes (CICs) at the center of the body's RA or SLE immune / inflammation firestorm. In rheumatoid arthritis, the thin membrane surrounding the joints (synovium) becomes swollen and extremely inflamed. As these attacks continue to occur, the bones and joint tissues are weakened and eventually destroyed, destroying the integrity of the joint, including cartilage which provides a cushioning effect. Excellent early results using the patented enzyme formula Wobenzym N were noted by researchers writing in 1985 in Zeitschr. f. Rheumatologie. In this study, patients took eight Wobenzym N tablets four times daily. Sixty-two percent of patients improved. A 1988 report in Natur- und Ganzheitsmedizin showed that the same formula can prevent further flare-ups and helps to lower levels of inflammatory-related circulating immune complexes in rheumatoid arthritis patients. Another study also published in Natur- und Ganzheitsmedizin in 1988 noted that Wobenzym N has demonstrated produced similar benefits to gold therapy but without toxic side effects. Most recently, researchers from the Ukrainian Rheumatology Centre, in Kiev, tested Wobenzym on 78 patients with severe, crippling RA and who were using other prime treatment drugs. All of the RA patients showed a decrease in CIC concentrations, averaging between 28 and 42 percent, and decreases in rheumatoid factors. Twenty percent of patients reduced their NSAID doses by 50 to 75 percent. One patient stopped taking methotrexate and experienced a clinical remission of the disease. Morning stiffness scores improved. More than half the patients rated thier treatments with Wobenzym as good, compared to only about a third of the patients using only medical drugs. "The study results therefore confirm that Wobenzym is a new and quite effective antirheumatic agent, which also presents the properties of a second-line agent," said the Russian researchers at the Second Russian Symposium on Oral Enzyme Therapy in St. Petersburg, Russia, 1996. At this same conference, researchers presented findings on Wobenzym and juvenile arthritis. In the study, among 10 children from the Paediatric Clinic of the Institute of Rheumatology of the Russian Academy of Medical Science, 10 children with JCA were given five tablets three times a day. They could also receive treatment with one NSAID in addition to Wobenzym. In the children, the number of actively inflamed joints was reduced from 44 to 15, especially in the second month. One patient with psoriatic arthritis experienced a significant reduction in dermal signs of the disease. The drug proved effective generally after four to five months of treatment. Systemic lupus erythematosus (SLE or lupus) most often strikes young women between the ages of 20 to 40. The condition is characterized by severe fatigue and butterfly rash across the face; debilitating pain and sweeling often occur in the hands, wrists, elbows, knees, ankles or feet. There may also be morning stiffness in the joints. Other signs and symptoms of lupus include a worsening of the butterfly rash across the face following sun exposure; a pale or blue tinge to the fingers when exposed to cold; and possibly hair loss. Lupus is a serious condition because it may also cause diseases of the internal organs, including the heart, brain, lungs, and kidneys, as well as bleeding, anemia, and chronic infections. With proper treatment, however, lupus can be controlled, and sufferers can expect normal life expectancy. While lupus is usually not a primary cartilage destroying disease, people with lupus may be put on high dose steroids for long periods of time and their joints wear out sooner. Enzymes also help to dissolve circulating immune complexes and antibodies that cause severe inflammation or SLE. According to D.A. Lopez, M.D., associate clinical professor of medicine at the University of California at San Diego Medical School and co-author of Enzymes: The Fountain of Life, animals suffering from this inflammatory condition, when given combination enzymes, have shown significant improvement. Over the years, a significant amount of medical research has been performed on enzymes and their use for circulatory and cardiovascular health. Scientists worldwide have found that vascular and circulatory disorders respond extremely well to systemic oral enzymes. If you ar suffering from, or at risk for, arteriosclerosis, thrombosis, and other coronary heart disorders, phlebitis, edema, serious varicose veins and other circulatory problems that affect the various organs, including the brain, lungs, heart, kidneys, and liver - combination oral enzymes may be an important supplement regimen for supporting your circulatory health. The role of systemic oral enzymes in heart health is becoming more important as medical researchers uncover a newly emerging disease pathway in which uncontrolled inflammation throughout the body can contribute to a wide range of deadly maladies, including heart disease, stroke, and other circulatory disorders. There is now convincing evidence that inflammation is strongly linked to heart attacks and stroke, according to Attilio Maseri, M.D., of the Catholic University of the Sacred Heart, Rome, writing in a recent issue of The New England Journal of Medicine. In that same issue of the prestigious medical journal, medical scientists from Harvard Medical School, long involved with the Physician's Health Study, report that curbing inflammation may be at the "heart" of a sensible cardiovascular health program. Fortunately, enzymes have already been proven, in many clinical studies, to safely lower the specific types of inflammation closely linked to heart disease. The study results, reported in 1997 in The New England Journal of Medicine, stem from the Physician's Heath Study, involving 22,000 male doctors. The study was halted in 1988 when researchers dicovered aspirin, a classic anti-inflammatory drug, significantly helped to lower heart disease risk among men. The findings were so significant that the researchers conducting the study believed it was no longer moral or ethical to deny the non-aspirin group this important protective agent. Not suprisingly, aspirin is a classic anti-inflammatory agent whose proven benefits include reducing risk for heart attack and most types of stroke, not to mention its very low cost to consumers and long-term stability. There is also emerging evidence that aspirin reduces risk for colon and breast cancer, and possibly Alzheimer's disease. Aspirin, however, does have significant complications with long-term use. I advise my patients to use aspirin for short-term needs but to always keep in mind that it is at the top of the list for gastrointestinal tract complications, including micro-bleeding and ulcers. Eterically coated or buffered aspirin is no less irritating, claims from manufacturers notwithstanding. There is also a small but very real risk among aspirin users for hemorrhagic stroke. Aspirin is without a doubt an important and proven medical tool but not innocuous. Most doctors today do not normally think of inflammation as a cause of heart disease when treating patients, and they rarely measure the body's inflammation levels. The way to find out the extent to which the body is undergoing significant inflammation, however, is to perform what scientists call a C-reactive protein analysis of the blood. Elevated serum levels of C-reactive protein are nonspecific but sensitive markers of the acute-phase response to infectious agents, immunologic stimuli (substances foreign to the body), and tissue damage as in heart disease. In the Physician's Health Study, Harvard researchers examined levels of CRP in almost 1,100 men, comparing some 543 who suffered a heart attack with the same number who hadn't. Elevated levels of inflammation throughout the body placed men at a threefold greater risk for heart disease and a twofold increased risk for stroke. Men who benefitted most from aspirin had the highest inflammation levels. Yet, dangerous levels of CRP were found in the high-normal range, especially in cases where patients are already suffering heart disease symptoms such as angina. "We have had some experience with the C-reactive protein molecule," says european enzyme researcher Rudolf Kunze whose IMTOX company holds two international C-reactive protein patents. "Although C-reactive protein has a very low concentration in the blood under normal, healthy conditions, it increases by 100 fold or more in pathological situations." "We don't know whether some prior chronic inflammation leads to atherosclerosis, whether atherosclerosis causes the inflammation, or whether atherosclerosis and inflammation run in tandem and accelerate each other," says lead investigator Paul Ridker, of Harvard. He adds: "Curbing inflammation is another way to prevent heart disease." People with heart disease risk, once other known factors have been ruled out, did not need to have extremely high levels of C-reactive protein to manifest heart disease risk. Rick increased when C-reactive protein levels were high within the normal range. What's more, substances that down-regulate the inflammation of blood and coronary vessels can help to prevent heart disease. Both aspirin and enzymes work extremely well, but enzymes have far fewer complications with long-term use. If we can harmonize and re-balance pateints' inflammatory pathways, particularly levels of C-reactive protein, we can help them to reduce their risk of heart attacks and stroke. Today, we finally have a safe anti-inflammatory tool: systemic oral enzymes. The most well researched, thouroughly documented enzyme mixture today is Wobenzym N from Mucos Pharma GmbH & Co, of Germany. We know that enzymes have a particular affinity for rebalancing the body's levels of C-reactive protein. IMTOX measured this protein in blood samples of healthy volunteers who took bromelain, papain and trypsin supplied by Mucos Pharma, which manufactures Wobenzym N. There were marked C-reactive protein reductions, Kunze reports. In another study, Wobenzym N was studied for its use in operative dentistry in a randomized, placebo-controlled, double-blind study. Prior to surgical dental intervention, 36 patients were prescribed ten tablets of Wobenzym twice daily. In the control group, 44 patients received placebo. This dosage was continued until the seventh postoperative day. By day three, C-reactive protein levels were three fold higher in the control group compared to those patients receiving Wobenzym N.
Enzymes benefit circulatory health well beyond reducing CRP levels. The key to blood flow and reduced risk of clots is typically low levels of fibrinogen. Unfortunately, impeded bile flow, diabetes mellitus, malignant processes and the natural aging process increase the plasma's fibrinogen concentration, exerting a negative effect on blood viscosity. Healthy breakdown of fibrinogen therefore plays a substantial role in improving circulation in the human body. Combination enzymes help to bring fibrin levels back into the optimal range, in part by reducing the thromboxane concentration or by directly blocking aggregation. Another way that micro-circulation is influenced by oral enzymes is by the ability of blood cells to alter their shape. The red blood cells are forced to adapt their form in order to pass through the finest capillary vessels. As they age, they lose this capability, thereby inhibiting or blocking capillary perfusion. Evidence that enzymes can clearly improve the ability of erythrocytes to alter their shape has been provided by numerous studies. Dr. Valls-Serra treated 245 patients with enzymes. The enzyme therapy proved to be very effective for patients with superficial and deep thrombophlebitis. The researcher observed a substantially better therapeutic outcome with the enzyme mixture than with conventional anticoagulants and vasoactive substances. Denck and Weidinger also investigated the circulatory enhancing effects of enzymes. They took 25 patients with deep venous thromboses of the legs and assigned them to one of two groups. The 11 patients in group 1 had suffered from the condition for an average of eight months. In group 2, the 14 patients had suffered from deep venous thromboses of the legs for more than two years. Twenty patients reported a reduction in the tendency to develop edema. The increase in venous capacity and the possitive effect on venous function were marked. Next, Gall verified the reports of Denck and Weidinger in a placebo-controlled study. Twenty-eight patients with deep venous thrombosis of the leg took part in this investigation. The group using the Wobenzym formula had a significant elevation in the venous capacity and substantially reduced obstruction. Maehder performed a field test with patients in private practice. Aside from the usual physical therapy, 216 patients with pathological venous conditions also received the enzyme formula. The dose ranged from three to ten tablets three times daily. The number of days of therapy, edema formation and swelling, pain, as well as skin symptoms on the afflicted extremity and the ability to walk were evaluated. The symptoms in 66 patients (30%) were cured and 134 (62%) were free of complaints with a substantial improvement in their objectifiable symptoms. Only 16 patients (7%) reported no change in their condition. Finally, Wobenzym N has been proven to work in cases of occlusive arterial disease. Rokitansky combined oral enzymes with the application of ozone in the treatment of 445 patients with occlusive arterial disease. Freedom from complaints was acheived in 79 percent of these patients with walking difficulties. Residual claudication remained in 12.4 percent and only 8.1 percent of the patients were resistant to therapy. Furthermore, it was possible to reduce the extent of any surgical interventions through this combined regimen. Aspirin is extremely well documented. We know that it can reduce risk for a heart attack or stroke. With Wobenzym, we don't have the same types of long-term studies relating to heart attack or stroke risk reduction. However, the scientific and clinical evidenceprovides strong support. What's more, in my own practice, I emphasize the use of Wobenzym N over aspirin and have had great results in keeping my patients alive and free from heart attacks and stroke, without the concomitant risk of ulcers and hemorrhagic stroke.